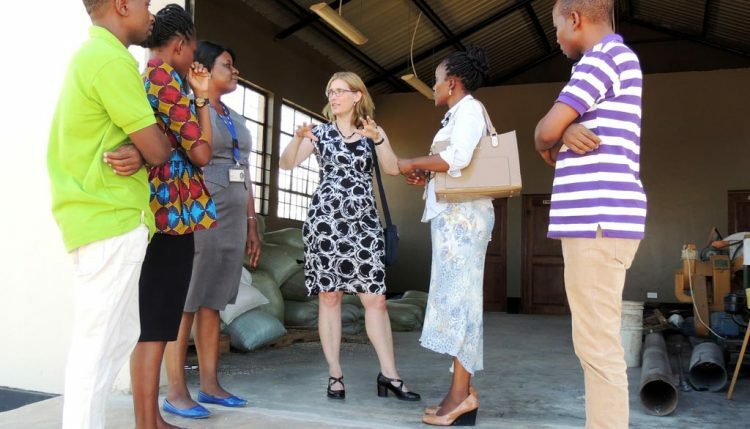 Hilde (middle) interacting with some staff members during her tour of the facilities in Tanzania. Her visit is part of her efforts to understand the operations at the hubs, and get feedback on how to improve Corporate Services since taking over the directorate in October last year. Koper-Limbourg informed the staff of the new Corporate Services strategy under development that was geared towards streamlining operations at the Institute to make them more efficient and provide value for money in the services offered by the units. These include hospitality and travel, facilities management services (FMS), supply chain, human resources and security. She also praised the hub, noting the many changes that had taken place since her last visit in 2013 during the official inauguration of the new science building. During her tour, she visited the scientific laboratories where the staff explained about their ongoing research activities. These included the soil, molecular, pathology, and food science labs. She also visited the Tanzania Youth Agripreneurs (TYA) incubation center at Kwembe, around 50 km from Dar es Salaam, to see their activities. 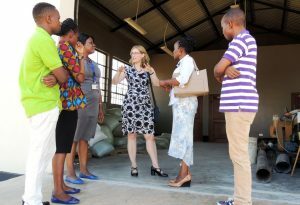 These included processing of cassava into high quality cassava flour; processing soybean into soymilk and soy yoghurt; and growing and selling vegetables. They are also providing services such as weed management through the judicious use of herbicides and training of farmers, and will venture into fish farming after they finalize the construction of the ponds. Koper-Limbourg was received and hosted by the hub director Victor Manyong, who also congratulated her on the new position and assured her of the hub’s support.